Baby Milk Action's campaigns calling on Nestlé to abide by the international marketing standards for baby foods force changes from the company. Sometimes it first dismisses allegations or attempts to justify practices - we are at this stage regarding the 'protect' logos on Nestlé formula - examples of Nestlé's promotional strategy can be seen on our Email Nestlé campaign page. 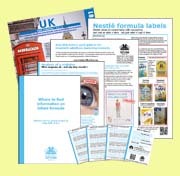 In its latest response to the campaign, Nestlé says it has discontinued leaflets claiming its formula is 'The new "Gold Standard" in infant nutrition', which are presumably too embarrassing to try to defend. In 2009 our exposé of promotion in rural Africa prompted it to clamp down on this prohibited practice. With further pressure we will persuade it to remove the idealising and misleading logos from labels. You can help. "Neither the container nor the label should have pictures of infants, nor should they have other pictures or text which may idealise the use of infant formula" [emphasis added]. The logos are not only a breach of this prohibition, they are misleading. In a letter dated 2 November 2010, Nestlé disregards Article 9.2 and defends the logos. We welcome you to investigate and critique the justification made by Nestlé. Its claims cannot be taken at face value, as we found when investigating its earlier defence of claims its formula contains 'Brain Building Blocks' (click here). Nestlé is still being disingenuous. For example, in its defence given below, the review cited by Nestlé recommending DHA and ARA are added to formula was funded by a company called the Martek Biosciences Corporation. Nestlé does not reveal this fact, but it is extremely relevant. Martek manufactures DHA and ARA using microalgae fermentation specifically for adding to formula. So Martek funded the review recommending its products are added to formula - this is known as a 'conflict of interest'. Nestlé suggests it accepts the findings of reviews by the Cochrane Library - that there is 'no proven benefit' from adding ingredients such as Long Chain Polyunsaturated Fatty Acids (DHA and ARA) - but continues to base its global marketing strategy on the addition of these ingredients. If there were proven benefit, Baby Milk Action would be campaigning for them to be added to the list of required ingredients for all formulas - and not be used for promotional purposes. See what else you can uncover by scratching the surface of Nestlé's claims. Bear in mind, that Nestlé claimed its formula is 'The new "Gold Standard" in infant nutrition' and is using other questionable claims in attempting to persuade health workers to promote its formula to parents (an example from Egypt is given left). Looking at who conducted reviews, who they work for and who funded their involvement is particularly relevant. And what do the organisations Nestlé cites actually say about adding DHA and ARA to formula? See what you can find out and post quotes and links in comments to this article - it would be useful if you can indicate your own area of expertise when you do. There are several misleading statements that jump out at us and we will compile source documents to demonstrate this - you can help. Information on our products labels is backed by scientific evidence. The 'Protect' logo is used on a new generation of sophisticated infant formulas with a unique combination of specific strains of probiotics, long-chain polyunsaturated fatty acids, immune-nutrients and selected proteins. This unique combination has positive effects on the infant's physiology and metabolism compared with other formulas without these ingredients. However, we in no way suggest that the formula is equal to or superior to breast milk. Contrary to what is suggested in your letter, we do not make any claim on the products labels that contradicts the Cochrane Library's reviews. Our statement is that DHA and ARA are "two special fatty acids found in breast milk, which are important to your baby's defence system, and contribute to the development of brain and vision"
These are simply matters of fact (see: http://www.ncbi.nlm.nih.gov/pubmed/18184094). A number of important international organisations and experts recommend that DHA and ARA be added to infant formula. These include the Food and Agriculture Organization (FAO), the World Health Organization (WHO), the European Society for Pediatric Gastroenterology, Hepatology and Nutrtion (ESPGHAN), the World Association of Perinatal Medicine (WAPM) and the Child Health Foundation. Regarding probiotics, we do not claim on labels that probiotics prevent allergic disease or food reactions. It is only stated that Bifidus L are "naturally active cultures that help to reinforce your baby's defense system". It is important to make a distinction between information that is included on a label for a consumer and that which is offered in a scientific and factual document for a health care professional. It is in the latter document that information on research studies concerning the protective effects of probiotics on allergic reactions and intestinal disease are discussed (for examples of this science, see: http://www.babymilk.nestle.com/Documents/scientific-substantiation.pdf). Update April 2011: Nestlé stated that WHO recommends that DHA and ARA be added to infant formula. This is untrue as WHO told Members of the European Parliament in April 2011, prior to the Parliament voting against authorising DHA claims. WHO stated: "WHO does not have a recommendation about the addition of docosahexaenoic acid (DHA) to formula milk.....to date no solid evidence exists to be able to say that adding DHA to infant formula will have important clinical benefits. Were WHO to give such a recommendation, it would have to follow a strict guideline development process based on grading of all available evidence collected through systematic reviews by expert panels free from conflict of interest."